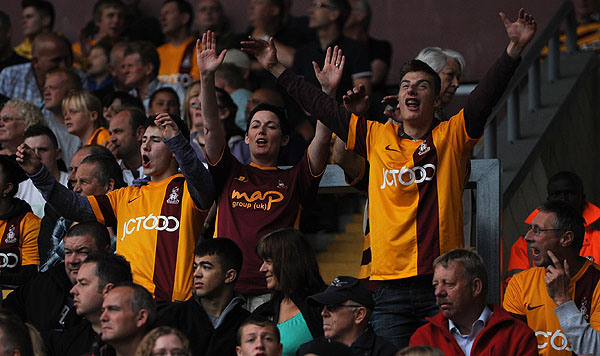 League One football returned to Valley Parade with a stylish performance as Bradford City destroyed Carlisle United. Greg Abbott’s side have suffered a torrid start to the league campaign having been walloped 5-1 at home to Leyton Orient last Saturday. They did manage a shock result over Blackburn Rovers in the cup mid-week; but if yesterday was anything to go by, Abbott will be out of a job very soon – at least for their sake Coventry have the -10pts, otherwise pathetically they’d be rock bottom right now. Phil Parkinson rung the changes from the defeat at Huddersfield recalling the big guns and starting with the same team that performed superbly at Ashton Gate on the opening day of the season. One change on the bench was Ricky Ravenhill for Jason Kennedy who was left out of the match day squad altogether. The Bantams started brightly enough keeping possession and playing some brilliant football. Having witnessed the 2-2 at Bristol City and then again yesterday, to me it is clear that we are evolving into a side that no longer hit it and hope to Hanson – we actually get the ball on the deck and play football. Man of the match Mark Gillespie, in the visitors’ goal, had already denied Nahki Wells when the Bermudan had raced clear on goal, along with a couple of other decent chances in the opening 20 minutes. However Gillespie could do nothing about the opener – an absolute stunner from Mark Yeates, his first for the club that sailed into the top corner after he had cut in from the left side. Funnyily enough, on the way to the ground we were chatting about Yeates and the type of goals he scores. A simple look on Youtube suggests that this is his type of goal – very rarely does he appear to get a simple tap in. 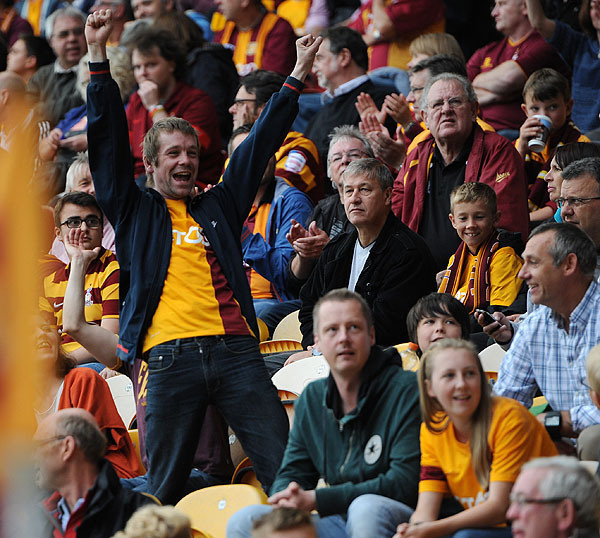 1-0 quickly became 2-0 as Carlisle offered absolutely no resistant to the rampant Bantams. A tame header back from the Carlisle defender was capitalised on by the hottest property in League One: Nahki Wells. He rounded the keeper and then, from a ridiculous angle near enough on the byline, bent the ball into the far corner. Game, set and match after just 25 minutes. 3-0 was soon to be shown on the score board as four minutes later thanks to James Hanson, who tormented the visitors all afternoon. Personally I think that was his best ever performance in a City shirt. For the goal he bullied Danny Livesey into hitting the deck, allowing the big man clean on goal and slotting home with his right foot to again send the Valley Parade faithful into dreamland. That is apart from the top tier of the T L Dallas stand, where I’m sure some of the Carlisle away support will have been rustling around in their pockets to find the car keys and make a quick beeline for the exits. The Bantams could and probably should have been 4-0 up at half time, as Garry Thompson was put clear through but Gillespie denied him with a great save to his right hand side. As half time arrived three sides of the ground rose as one and roundly cheered Parky’s men off in recognition of a sensational first half performance. Into the second half it was more of the same as Bradford laid siege again to the Carlisle United goal. By this time, the chap in charge of the score board must have felt it would read better if Carlisle was changed to Gillespie because it was basically a game of attack vs keeper. What was in-between Gillespie and Bradford was a poor excuse for a side. The keeper made a string of brilliant saves in the second half. I’ll probably miss some, as we had that many chances it’s difficult to remember them all, but Wells was denied at least three times. Thompson missed two glorious chances. On another day both Wells and Thompson would be fighting over the match ball. Gillespie also denied Yeates from doubling his tally, after a fantastic solo run in the visitors’ penalty area, where he must have gone past three maybe four Carlisle defenders before poking it towards goal where it was easily dealt with. The performance at times from Yeates was the closest thing to Peter Beagrie we’ve had since the City legend departed the club 12 years ago. The passage of play I’ve just mentioned brought back memories of when Beagrie did the same thing on a near identical part of the pitch against Coventry, only that time the ball nestled in the back of the net. The fourth goal arrived midway through the second half. Wells closed down a clearance and, from the half way line, was clean through on the right. He reached the penalty area before pulling it back for magic man Gary Jones, who ran 60 yards or so to get with play and calmly slotted it into the bottom corner. Cue a booming rendition of “He’s magic, ya know” – I love that man! That was the end of the scoring, but not the chances. Rafael De Vita had by now entered the fray and twice he went close with headers. Hanson and Jones both also had opportunities. Had the game finished 10/15-0 that would have been a fair scoreline…ridiculous! A special mention to the visiting fans, who despite been 4-0 down and being torn to pieces applauded Wells off the pitch when the striker was subbed late in the day. That shows class. Personally, had it have been the other way round I’m not sure I’d of been applauding him off, especially given he only made a handful of appearances for the Cumbrian side. I personally can’t see how Wells will still be at a Valley Parade before the transfer window shuts. A host of clubs must be looking at him and they can’t fail to be impressed. Somewhere in the region of £2 million plus, at a guess, would be enough to land him. If he goes we are danger of blowing a great opportunity of having a real go at challenging for back-to-back promotions. A note also for the back five, who let’s be honest probably won’t have an easier game all season, but still carried out their jobs professionally. I’d love to know how many yards James Meredith covers on the left hand side during a game. He’s up and down that wing like a yo-yo – one of the best, if not the best, left back in this division in my opinion. 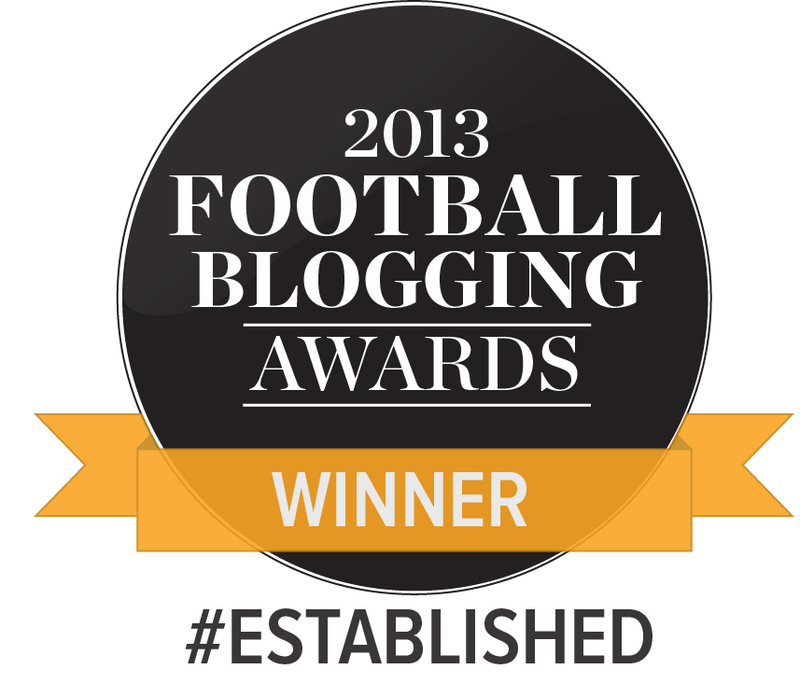 As the full time whistle went I was quite disappointed. Disappointed that I didn’t have another 30 minutes or hour more of watching Bradford torment and batter the visitors. Very rarely do these type of performances come along where it is so easy and so one sided – and you have to enjoy them. Because it could be another month, six months or a year before we win at such a canter again. It might only be two games old but so far so good. It’s feels great to be back in League One. A special, special thanks to Claire Epton for providing the wonderful images included in this report. Take a read of her blog, because it’s ace and full of similarly brilliant photos. Very nice report apart from your pessimistic view on the chances of Wells staying. Personally I think he will give us a season to see if we can get promoted again. Also feel that 2 million is too low amount to be letting him go for. I’d expect at least 5-6 mill. Look at the price other proven lower league strikers go for. Bradford consistently undervalue themselves, and if we are going to sell our best players we should make sure we get the ‘going rate’. The only difference in our team that started yesterday to last season was Yeates……yet the quality of football was so much better than that played last season. I remarked last season that the team that Parkie put together was built for a higher league not League 2….having said all that were we made to look good by a very poor Carlisle side? Absolutely brilliant! Our pattern of play to our front two all afternoon caused serious damage Carlisle. Just how we can gauge how good we are on this performance is up for debate. I expected so much more from a team prepered by Gregg Abbott in fact there was no fight from his team at all,men vs boys in my opinion. 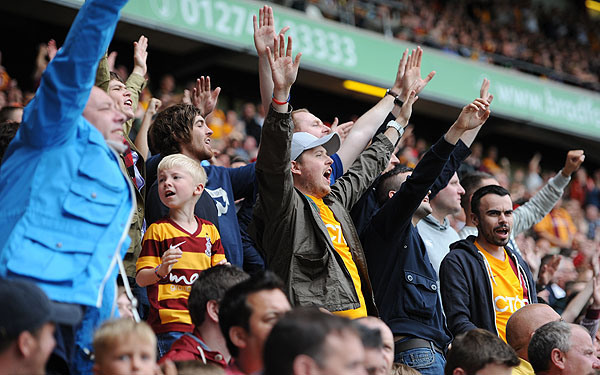 Long gone are the days of teams coming to valley parade and bullying taking back 3pts with no resistance! Our players give everything at first winning the physical battles then our quality on the ball shines through! . I get hammered for it I dont care James hanson is becoming the complete centre forward , hes awareness of players around him and picking the pass out is excellent. That partnership with wells is deadly . With just under 12 months left on Hansons contract I’d urge phil parkinson to move fast and tie james down asap! . I’ve been torn since 5pm on Saturday between putting all my money on us going up this season and dismissing the Carlisle game as simply a day when everything went right for us and wrong for them. Maybe it went wrong for them so frequently because we made it so, Wells harrying the full-back for our 4th being a prime example. But I think it worth noting that against a team that had given its all midweek, every bounce and ricochet went our way on Saturday, so I’ll keep my money… for now. No escaping however that we did look fantastic, balanced, and positve. The back 5 looks solid, Jones and Doyle going about their business like well kept metronomes, and two wingers who can cross! I must say, the thought of playing against Yates and Thompson for an hour only to see Reid and Da Vita on the bench must worry plenty of L1 full-backs! But, like everyone else, what impressed me most was the front two. I am really glad their performances were not reversed; Wells was hard-working yet at times profligate, something that earned Hanson quite a bit of stick last year. But (like Hanson) he kept going and his class showed on enough occasions in the game. Hanson on the otherhand was faultless throughout. Did he lose a header at all? When Davies and McArdle launched it he did the donkey work, nearly always finding a City shirt, but when he had a chance – and Jones, Doyle and Yates gave him plenty, he played some cultured stuff. With Yates and Thompson providing the type of crosses that saw Hanson rattle the crossbar against Villa at VP, we might be looking at one hell of a player this season. I thought we were fantastic all over the park and we showed them what heart and team work means. For me there keeper was useless yes he made a couple of good 1 on 1 saves but he flapped at a lot of crosses and he was all over his area in no mans land looking very confused and im sure the defence were weary of him too which is why they made mistakes. Yeates was my man of the match followed by Hanson and Darby who kept the tricky Amoo at bay for most of the game. Yeates would be my bet for player of the season now and with Thompson on the other side we should be one of the highest scorers in this league come season end. I have a couple of negatives to get out of the way. Even though it was a great performance im not keen on Kyel Reid at the minute and I wouldnt have him in the squad. I thought he’d be a great impact player coming off the bench but he made no impact at all. Also why doesnt Jones take the corners once Reid comes on because Reid never gets past the 1st man at corners or free kicks. Im thinking we’ll finish minimum 10th to promotion.